Blizzard! is an expressive choral depicting a coming snowstorm. Sung in a brisk 6/8 meter with articulation, dynamic contrast, and a very expressive piano accompaniment, the listener easily imagines the snowflakes as they come down one by one, swirling and building into a blizzard of choral sound and excitement. A fresh winter number! Available separately: SATB, SAB, PianoTrax CD (35027473). Duration: ca. 2:26. Rolling Stone magazine ranked this holiday rock song as #1 of The Greatest Rock and Roll Christmas Songs, noting that nothing can match Darlene Love's emotion and sheer vocal power. This arrangement equals the original recorded version and will be a powerhouse addition to your holiday concert. Instrumental parts available for a festive performance. This gorgeous original ballad by Ruth Elaine Schram beckons back to a time of innocence and beauty during the holiday season that is sometimes forgotten in the rush of the commercialism of today. Dreams, snow, packages with bows... when all the lights are out and children are in bed, when dreamy visions dance inside each sleepy little head, when everyone's tucked in, Christmas can begin. This is an elegant choral with a gentle piano accompaniment and delicate harmonies. Incorporating Ding Dong, Merrily On High and the chorus of Angels We Have Heard On High with original words and music that nod to Deck the Hall, you have a powerhouse holiday arrangement suitable for your young and changing voice choir. 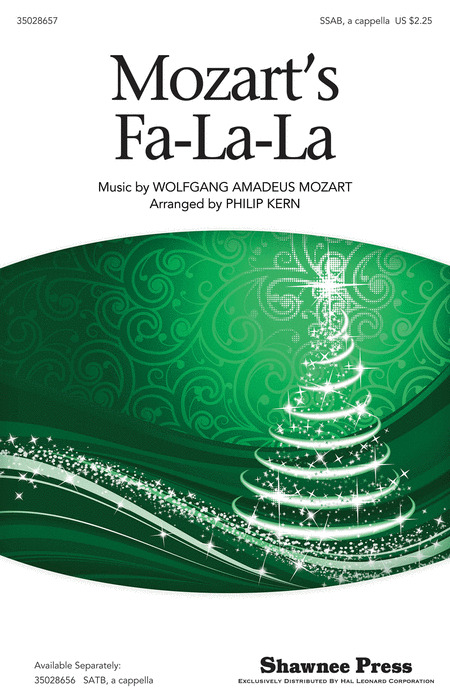 It's festive with a supportive piano accompaniment and suitable for school as well as church. Mary Donnelly : Getting Ready for the Holidays! Let's hang some tinsel on the Christmas tree, put up some shining lights for all to see, and decorate in a million ways! These phrases and many others make up this bright choral that set the scene of getting ready for the holidays. Partner song in style for three voices! A great lighter number for your concert and easy to learn for limited rehearsal time! Available separately: 3-Part Mixed, StudioTrax Cd. Duration: ca. 1:52. New words and original music add to the melody from Henry Purcell's spirited Sing for Joy to create a perfect opening holiday choral work. Unison singing introduces the melody, which develops into homophonic parts. A bridge of original music adds newness to the Purcell melody. The optional trumpet and bells add texture to help make this sparkle for the season. A traditional Christmas favorite with a jazzy, rhythmic twist. Energetic syncopation and some melodic alterations will make this three-part mixed arrangement of Hark! The Herald Angels Sing a new concert favorite for choir and audience alike. Mixed meter, dynamic contrast, whimsical accompaniment and lively vocals create a dance-like arrangement of this traditional carol. The original English text surrounds the few Latin phrases used throughout the work and helps make for easy learning. Mixed choirs will love this as a processional or opening number. Jolly Old Saint Nicholas gets a bit jazzy in this new arrangement for the holidays. Starting with the familiar tune, it moves into a relaxed-rock feel with easy jazz harmonies and continues into a jazz waltz. There's even a classical section and plenty of opportunities for solos. A terrifically musical choice for your holiday concert! Jingle Bells takes on a funky '70s/'80s-feel complete with the choir playing sleigh bells! A fun new take on a favorite holiday tune. Add some choreography for a great finish to your concert or encore selection! Available: 3-Part Mixed; 2-Part; StudioTrax CD. May we, like merging flakes of snow, come together and unite. Herb Frombach's lyrics call for us to come together in peace blanketing the world with love. This is a powerful message for winter and holiday concerts. Vicki Tucker Courtney's piano accompaniment is gentle and moving under vocals that sing in harmony throughout. Gentle, yet dramatic in dynamic contrasts. Superb choral writing!